According to Greek mythology, the goddess of love Aphrodite was born from an oyster. And so it’s little wonder that already the ancient Greeks and Romans believed in the aphrodisiac effect of oysters. Still today, many a cavalier bets on this seafood delicacy when preparing for a romantic candlelight dinner. Whether and – if so – how many oysters are indeed able to stimulate the libido is likely depending on the belief of the person eating them. But there is no doubt that when enjoyed with a squirt of lemon and together with fine champagne, they are a delicacy that is cherished by a community of oyster lovers all around the globe. Already back in Ancient Rome, oysters were a firm part of any festivedinner. The emperor Vitellius reportedly ate more than a thousand oysters during a single orgiastic feast. And also Julius Caesar was very fond of his oysters. Necessity is the mother of invention, as can be seen already back in the days of the ancient Romans. When the demand for oysters exceeded the available supply, the Romans imported oysters chilled with blocks of ice from Britain and France. Excessive consumption of oysters remained a privilege of the rich in the following 2000 years to come. As oysters are light and easily digestible, it is indeed possible to consume large amounts. However, historic reports of oyster gluttony should be taken with a pinch of salt. Oysters are a very special kind of shellfish. It takes three to four years for an oyster to be fully grown. Having been around on our planet for more than 250 million years, they settle in places with strong tides.Firmly anchored to the ground, the oysters are filter feeders getting theirfood from the surrounding waters. One single oyster filters about 250 li- tres of water per day – and this water must be very clean since oysters are extremely sensitive to pollution. Connoisseurs only eat oysters between October and April, then they are no longer milky and have the best flavour. Oysters are very rich in nutrients and are said to be good for your health. 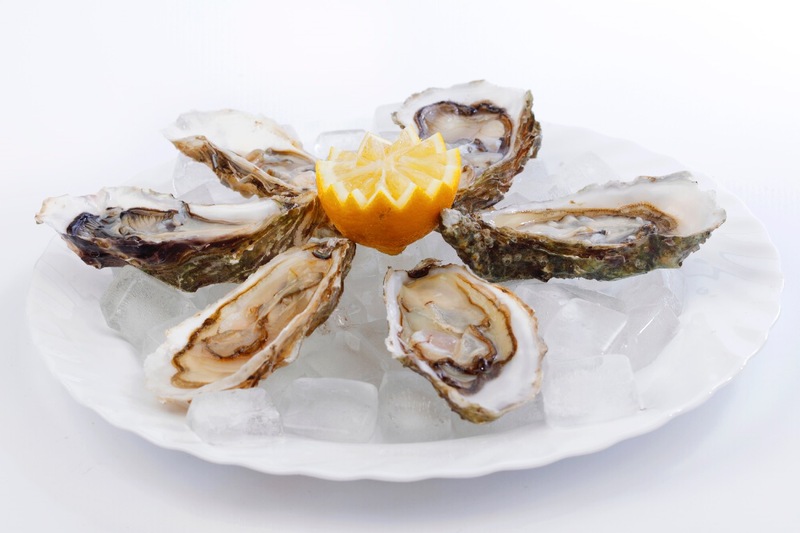 Even though the re- ported aphrodisiac effect is not scientifically proven, they are certainly good for your waistline, as oysters consist to more than 80% of water, 9% of protein, 4.8% of carbohydrates and only to 1.2% of fat. Addition- ally, they contain the vitamins A, B1, B2, B12 and many minerals. Today, over 97% of the globally sold oysters are Pacific oysters. They areusually traded as ʻFines de clairesʼ. By far the largest quantities of oysters are consumed in the Far East. While oysters in Europe are typically enjoyed raw, the Americans and Asians prefer them cooked. Anyone who is looking for an extraordinary nature and taste experience and is not afraid ofchilly temperatures should book an ʻoyster safariʼ off the coast of Denmark. Nature guides takeguests on an insightful trip between the islands of Rømø, Mandø and Fanø in the North Sea looking for Pacific oysters. During this oyster safari lasting several hours, participants learn a lot about the tremendous increase of the Pacific oyster in the tidelands of the North Sea, the history and future of the region or about the nature on and around the islands of Rømø, Mandø and Fanø and their surroundings. The final highlight of the oyster safari is the tasting of the collected oysters with lemon and champagne.